And here's one more part It could have been the last, the end, that's all. But I have started part 4, and have thoughts about part 5. I will not be posting those. And after a few days I will be taking these parts down. I can't have part of "The Book" up here. It may be time to just work on it while I post "other stuff". Read these in order if you came here by chance. Here are the links: Part 1, Part 2. Let me know what you think. Really. Pretend you are an editor, or a reader (which shouldn't be too hard to do, given that you are reading this). I will not be hurt so much that I can't recover, but I may be nudged just enough to become a better writer. That’s what they were now. Sitting there dead on the bottom of the ocean, cut from their lifelines. The morning those yellow and white silent guards were freed from their watery posts above the traps, was the best morning ever. The ocean was sparkling as we thumped across the bay. The haul was lighter than most days, but in a day or so, when the bait in the abandoned traps was gone, things would get back to normal. For a while those shells of traps would be picking up some stupid lobsters; the ones that didn’t know any better than to wander into a kitchen with no food. But, like a “timed release” cold capsule, the hinges on the traps’ escape panels would dissolve, and the traps would never steal another lobster from my grandfather. For now, Gramp was pleased. The Cammy May would not be trolling these waters. Gramp’s fields were his alone again. Macy would think twice about plopping traps down in another man’s waters now. Or one would hope. I’m pretty sure in years to come it will still be a mystery as to who cut the lines to Macy’s traps. I’m sure Gramp thought it was Garrison, next door. Garrison would have seen Macy’s buoys as he made his way out past my grandfather’s to his own. It wasn’t like Garrison hadn’t taken matters into his own hands before. You just don’t mess with people’s livelihoods here without consequences. Sometimes it was worse than cut lines. I’d heard of boats getting all stove up and other “accidents” along the coast where lobstermen were feuding. Garrison and Gramp were good neighbors to each other. Not friendly friends, like “payin’ a visit and having a cup of tea” friends; just good neighbors who would give you the shirt off their back...or cut someone’s trap lines if they were in your way. I’m pretty sure Garrison, must have had his own ideas as to who cut the lines. He probably thought it was Gramp himself. But they weren’t about to ask. It wasn’t a thing people talked about or bragged on. It was just settled quietly, no questions, and you just went on doing what you do. The Marine Patrol called Gramp when Macy reported his lines cut, and the matter was looked into for a couple of days - well, more like minutes. 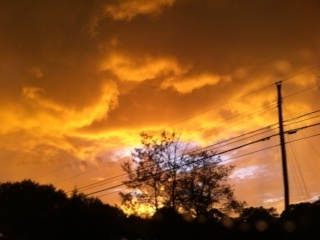 and was set aside. It was just one of those things that happened when you didn’t play by the unwritten rules of the sea. Most likely no one’ll ever know who cut the lines that night. Did I say night? Hey, it could’ve been morning. I’m older than they think; I’m not stupid. I know the rules. All’s fair in love and lobster wars. I smiled to see Gramp in the dooryard painting the greens on some new buoys, humming up a storm. I scrambled to find another paintbrush, then stood shoulder to shoulder with him, adding my low whistle to his tune. And here is my second entry, that gives a bit more of the story from yesterday's first entry. I have one more part I was debating about entering if I got to the final round. Maybe I'll post that, too. Or maybe I should keep it for "The Book"! Biscuits were in the oven baking up golden as the evening sun. I heard the familiar chugging as I set the supper table. “Men’ll be in any minute... Potatoes, cabbage, corned beef. Biscuits almost ready... Butter. Salt.” I rubbed my hands down my faded floury apron. The scrape of their boots trudging up the steps to the porch, the screen door slamming as they entered the mudroom and hung up gear - they were as comforting as any sounds I’d ever heard. Breathing came easier when I knew they were safely returned to shore. Silently, they went off to wash up; husband to the kitchen sink, grandson to the upstairs bath. “Coffee or tea, Cap?” I asked, bending to get the biscuits from the oven. They sat at the table in silence as potatoes and biscuits were handed around, and the corned beef and cabbage were dished out. “Set his traps in mine,” Cap’s words were low and released slowly. I barely caught them. “What...who? Who’d do that? Not the new guy?” I could feel the life draining out of me. 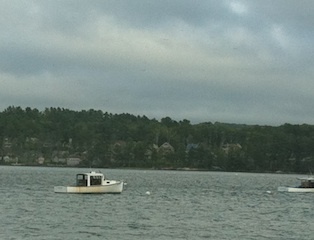 Cutting in on another lobsterman’s fishing territory was dangerous business. Lost in his stormy thoughts, our “dinner conversation” was ended; I knew there’d be no drawing him back. 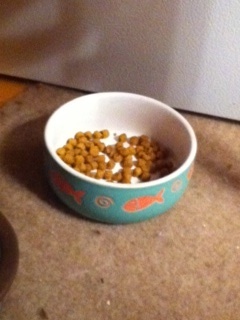 Pushing his plate aside, Cap picked up the newspaper and went to the living room. Jesse quietly excused himself and retreated upstairs to listen to music or read, or whatever he did up there when it was too quiet down here. I sighed and cleared the dishes. In the soapy water, my fingers felt around on the sink bottom for forks or knives. There were no little buoys attached to tell you they were submerged down there. I laughed to myself and drained the sink. I settled into my chair next to Cap’s, and studied his weary face. It had been a hard day added to hard years - good years though. I yearned to erase those worry lines and smooth the time wrinkles. It was early, but Cap folded the paper, and pushed himself out of the chair, straightening slowly. “I’m just going to sit up a bit,” I reached into the sewing basket by my chair. “ ‘Night, “ he whispered, kissing my forehead. The stairs creaked under his weight, and then I heard the bedroom door close. I waited until there were no more sounds from above, assured he was asleep. Dropping my sewing back into the basket, I headed for the door. I grabbed my coat, and found his knife and flashlight in his gear. I silently slipped out into the darkness, heading for the boat. A few cuts and Macy’s buoys would be gone, and his traps dead on the ocean floor. “No little buoys to tell you where they are...” I laughed to myself. I had two entries on DL Hammon's Cruising Altitude 2.0, WRiTE Club in the writing challenge over the past two months. I made it pretty far. Unfortunately, for me, but fortunately for others, I was out for this next round. There are two good writings going up this week (TTh) to vote on. But now that it is done, and since it has been online already anyway....I'm posting my first 500 word story here now. And tomorrow I'll post the next part of it (which is what I submitted for Bout 4). Let me know what you think. Could I expand this into a whole book? I think I'm shaking. Should I try to turn from teacher to writer in my retirement? There's that shivery, shaky thing happening again. I could see his jaws working, chewing on the toothpick. He spat in the water. Daylight was just spilling on the waves as we came into open waters. There among the red of my grandfather’s buoys were yellow ones indicating traps below; unwelcome traps set alongside my grandfather’s. Many had seen Mark Macy as he arrived to register the “Cammy May”. His questions about the best places to set traps had gone unanswered. Who in his right mind would tell him that? Besides, if it was good, it was taken. Someone finally told him a possible location - not the best, not even a good one. It hadn’t been fished for the past five years for a reason. Macy’d have to earn and learn his way into good fishing, just like everyone else. But now the newcomer to Springer’s cove had invaded Gramp’s traps. Somehow he must have “learned” that the other location was dry. Had he sensed their amusement? Had he overheard talk down at Hershel’s Bait? My grandfather pulled his traps, edging his boat around the yellow infestation. The haul was good, but not as good as most days. Our live-tank was three quarters of the normal haul, enough to pay bills, I was pretty sure, but not enough to have some aside for winter. Finished, Gramp steered homeward, moving fast, cutting through the caps. He was quiet, staring straight ahead, no familiar tune from his grim lips as we turned into the cove. The gutteral chugging of the slowing engine almost calmed my pounding heart. Pulling up alongside the pier, I spied light from the kitchen window. My grandmother would be setting the table for evening meal. “Set his traps in mine,” was all he said as he sat down. “What? Who? Who’d do that? Not the new guy?” Grandma’s face grayed. Picking at my food, I tried to make myself eat. I understood the seriousness of Macy’s actions, but at fourteen, I couldn’t think of anything helpful to say or do. After supper, I escaped to my room. The sound of the phone gave me a jolt. Had I fallen asleep? Breakfast smells told me I had. I heard my grandfather’s voice low and steady. I tossed the covers back, slid into clothes and scrambled downstairs. With breakfast remains still on the table, Gramp was getting gear ready to go earlier than usual. I grabbed bacon and toast and followed him out to the pier. No words were exchanged as we untied the lines and shoved off. Slicing silvery calm, we made our way out of the cove. Gramp’s face was emotionless, and I held my breath as we neared his spot. No yellows. I exhaled slowly in relief. “Been weeded,” was all he said, his blue eyes dancing like sunlight on waves. Macy’s lines had been severed, leaving ghosts traps to rot on the ocean floor. But somewhere yellow buoys were floating free. 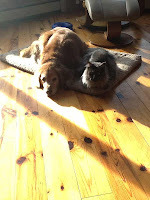 I have been cleaning out junk and dusting spots that haven't known the unfiltered sun for their whole life in my home. I have just a bit more to do. On Thursday, we are having the largest Thanksgiving group we've had in a long time... 19 people...maybe 20. Children, grandchildren, brothers, sisters, nephews, nieces, great grammie, friends...our two newest relatives will be there...Felix and Zeta. Everyone ranging from 5 months to 85 years. And we are going to have the best time ever! 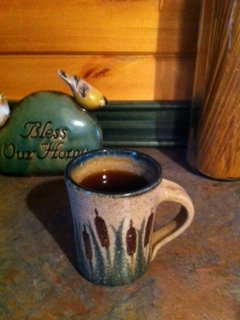 A new coffee carafe arrived yesterday for our coffee maker. Now we can make lots of coffee. I just bought extra flatwear so we have enough extra for company. My son gets it when we are through using it. He's buying his first house in a few weeks, so he needs more than two forks now! My daughter and her husband will be here late tomorrow, as far as I know. They will be sleeping in the loft. So they need a bed. The new mattress will be delivery by UPS any minute. On Friday the new mattress pad for it arrived. They need curtains up there, too. There haven't been curtains there until today... 14 years it's taken to do that. My mother-in-law will be sleeping in the guest room. That is all set with fresh sheets, candies, tissues, cozy comforter.... My husband just left for the bus station about 45 minutes away to pick her up. I'm so excited. I have to get back to tidying and cleaning. Tomorrow is pie baking day! Everyone in Bloggerville...have a wonderful Thanksgiving! And even if you don't celebrate Thanksgiving where you are, I'm sure you are still thankful about something...so celebrate your family and the blessings you have been given in your own special way anyway! When the sun is low. 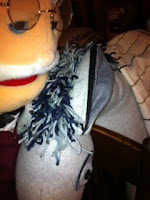 Gramps is a purchased puppet for our Junior Church programs. We needed a donkey for Christmas. And we needed two really. One for the puppets to introduce the Christmas program and one for the program that is big enough for Mary to "wear" when traveling to Bethlehem. So here he is - Burrito, the transformer donkey. He's really two pieces (cleverly concealing the two parts with his blanket. 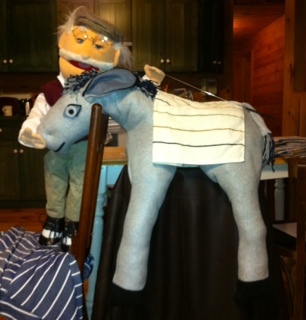 The puppets can ride on him on Sunday to get the kids revved up for the next program. Then for the actual program there will be a wider blanket covering the front to back on one side and some fake "Mary legs" on the other side. 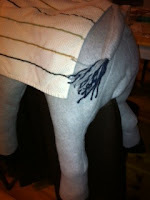 Mary will be able to stand in the middle, belly area, to walk down the church aisle with Joseph leading him. I haven't finished the actual joining of the two parts and adding the shoulder straps to keep him up, but those are definitely the easiest parts. With no pattern and never having made one before, it was a challenge to cut and sew this into being. He was totally from scratch and cut freehand. I'm pretty pleased with how he turned out! I'll try to remember to post a picture of him in his "Mary costume" when I'm done. If you haven't been to DL Hammon's WRiTE Club yet, there's still time and plenty of good writing to read and vote on! The first round consisted of 72 writing pieces of 500 words or less, 2 writers pitted against each other, until it was down to 36. Then those 36 winners of the first bout were rematched down to 18. The remaining 18 were allowed to edit their pieces if they cared to before the third bout. So this is a good place to jump in if you haven't before. These pieces will be up until Sunday on three websites (to spread the traffic around). After that the 9 winning writers (plus the entry that didn't make it, but got the most votes) will submit a new story for the next round. You can always go back and read the original entries if you care to. Then go on to the bouts and VOTE for the one that knocks your socks off! Or at least tickles you somehow. Today you can vote on Bouts 1 through 6. As it gets down to the wire and more people are eliminated, a fresh batch of eyes to read entries would be wonderful!!!!! I hate when I wake up and need coffee. But I need coffee. Because I'm not really awake. Got on the computer as soon as I physically got up. Stared at it a while. Realized it was Monday, so I clicked on the WRiTE Club button to vote on the next round of stories. The cat yelled at me for not getting him food yet. Now he's on the table right in back of my laptop screen, looking at me. He's been rubbing on the stack of papers on the table and thinking about pushing them onto the floor. That always gets my attention. Sometimes I've rewarded him with food when he has done that. Because he's persistent. And he doesn't need coffee to be awake. I think I will stop staring at this computer, and start the coffee and feed the cat. Or maybe feed the cat, then start the coffee. That's probably safer, though it delays my coffee...I think I need to go with safer. I should set the coffee to come on automatically tomorrow morning, so I can vote at the polls (corrected spelling from poles - is anyone actually AT the poles' polls?) with a better mind than I have right now (see previous parenthetical remark). I'm sleepy. I need cat food. 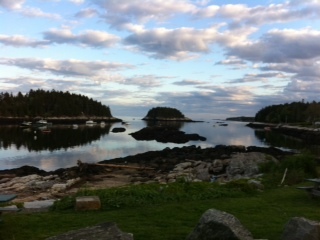 Welcome to Poetry Friday from Coastal Maine! I'm so excited to be hosting my first Poetry Friday. You may link directly below by clicking "Add Your Link". You may comment in comments also, if you like, but I won't be putting up links from there. Just click on the links to go to the poetry site and let them know you read their post! Did I mention that I'm excited? Never tried this before. This is up early, so if you need to post earlier than Friday...feel free! Just want it to go. Is so much a bother. With what it would bring.